The Particles Plus 2301-1 Remote Particle Counter measures 0.3 μm and 0.5 μm with a flow rate of 0.1 CFM (2.83 LPM). The Particles Plus 2301-4 Remote Particle Counter measures 0.3 μm, 0.5 μm, 1.0 μm & 5.0 μm with a flow rate of 0.1 CFM (2.83 LPM). Integration is easy into a real-time monitoring or building management system via Modbus RTU or ASCII. The 2000 Series is the smallest remote particle counter on the market and has easy mounting options. The Particles Plus 2301 units comply with ISO 21501-4 and include a 2 year limited warranty. The Particles Plus 2310-1 Remote Particle Counter measures 0.3 μm and 0.5 μm with a flow rate of 1.0 CFM (28.3 LPM). The Particles Plus 2310-4 Remote Particle Countermeasures 0.3 μm, 0.5 μm, 1.0 μm & 5.0 μm μm with a flow rate of 1.0 CFM (28.3 LPM). Integration is easy into a real-time monitoring or building management system via Modbus RTU or ASCII. 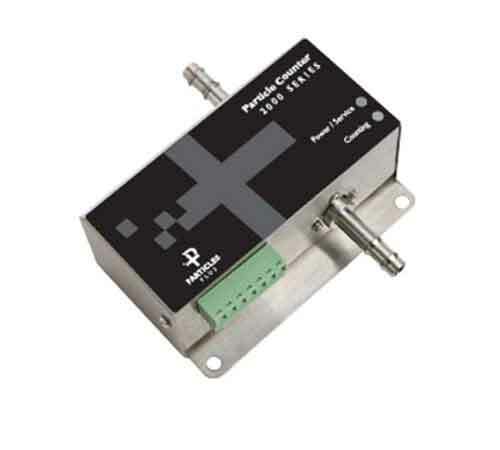 The 2000 Series is the smallest remote particle counter on the market, with easy mounting options. The Particles Plus 2310 units comply with ISO 21501-4 and include a 2 year limited warranty. The Particles Plus 2501-1 Remote Particle Counter measures 0.5 μm and 5.0 μm with a flow rate of 0.1 CFM (2.83 LPM). The Particles Plus 2501-4 Remote Particle Counter measures 0.5 μm, 0.7 μm, 1.0 μm & 5.0 μm with a flow rate of 0.1 CFM (2.83 LPM). Integration is easy into a real-time monitoring or building management system via Modbus RTU or ASCII. The 2000 Series is the smallest remote particle counter on the market and has easy mounting options. The Particles Plus 2501 units comply with ISO 21501-4 and include a 2 year limited warranty. The Particles Plus 2510-1 Remote Particle Counter measures 0.5 μm and 5.0 μm with a flow rate of 1.0 CFM (28.3 LPM). The Particles Plus 2510-4 Remote Particle Countermeasures 0.5 μm, 0.7 μm, 1.0 μm & 5.0 μm with a flow rate of 1.0 CFM (28.3 LPM). Integration is easy into a real-time monitoring or building management system via Modbus RTU or ASCII. The 2000 Series is the smallest remote particle counter on the market and has easy mounting options. The Particles Plus 2510 units comply with ISO 21501-4 and include a 2 year limited warranty. The Particles Plus 5301 Remote Particle Counter measures 0.3 to 25 µm with a flow rate of 0.1 CFM (2.83 LPM) and can display up to 6 particle size channels as well as (optional) temperature and humidity data on it’s 4.3” color touch screen. This continuous use particle counter utilizes the best long life optical technology in the industry. The Particles Plus 5301P Remote Particle Counter measures 0.3 to 25 µm with a flow rate of 0.1 CFM (2.83 LPM) and can display up to 6 particle size channels as well as (optional) temperature and humidity data on it’s 4.3” color touch screen. This continuous use particle counter utilizes the best long life optical technology in the industry, and includes an internal vacuum pump. 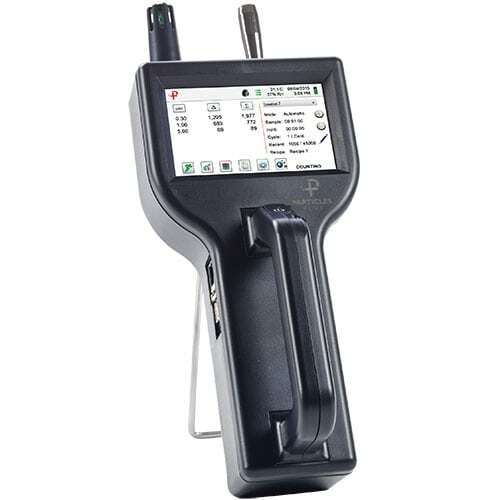 The Particles Plus 5501 Remote Particle Counter measures 0.5 to 25 µm with a flow rate of 0.1 CFM (2.83 LPM) and can display up to 6 particle size channels as well as (optional) temperature and humidity data on it’s 4.3” color touch screen. This continuous use particle counter utilizes the best long life optical technology in the industry. 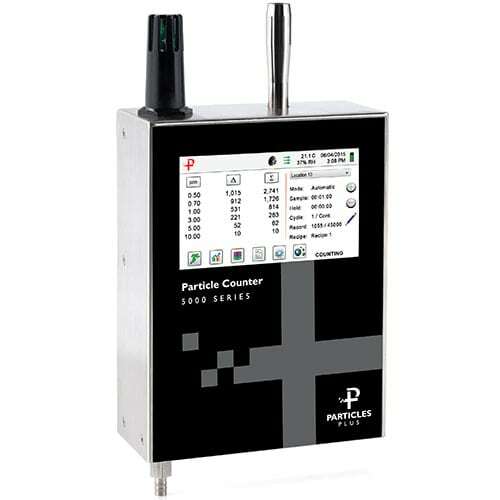 The Particles Plus 5501P Remote Particle Counter measures 0.5 to 25 µm with a flow rate of 0.1 CFM (2.83 LPM) and can display up to 6 particle size channels as well as (optional) temperature and humidity data on it’s 4.3” color touch screen. This continuous use particle counter utilizes the best long life optical technology in the industry, and includes an internal vacuum pump. 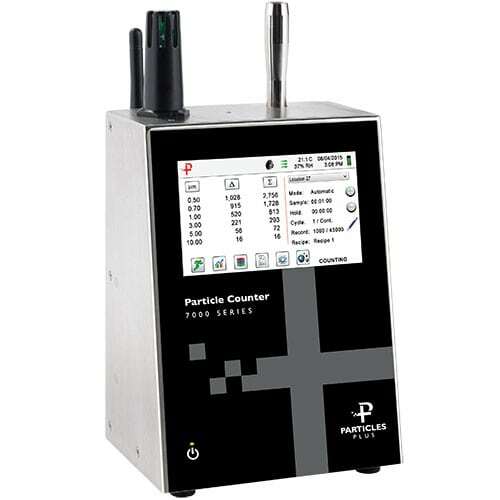 The Particles Plus 7301 Remote Particle Counter measures 0.3 to 25 µm with a flow rate of 0.1 CFM (2.83 LPM) and can display up to 6 particle size channels as well as temperature and humidity data on it’s 4.3” color touch screen. This instrument has a built-in vacuum pump and can be used as a stand-alone battery operated unit or as a real-time particle counter in continuous mode. The Particles Plus 7501 Remote Particle Counter measures 0.5 to 25 µm with a flow rate of 0.1 CFM (2.83 LPM) and can display up to 6 particle size channels as well as temperature and humidity data on it’s 4.3” color touch screen. This instrument has a built-in vacuum pump and can be used as a stand-alone battery operated unit or as a real-time particle counter in continuous mode.